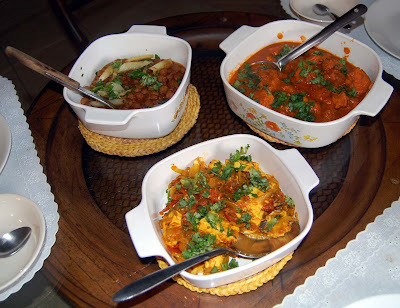 From foreground, clockwise, these are a few of the traditional Indian dishes I enjoyed on New Year's Eve: homemade milk cheese with onions and peppers, chickpeas topped with potato slices, and chicken curry. It was all enjoyed with unleavened wheat bread. A month after I ordered it, my passport showed up in my mailbox a week ago. I'll need it if I ever travel overseas or even 15 minutes away from my hometown in Maine to Canada. I've never been able to experience foreign countries (Canada doesn't count), and now that I have a passport, I just need to find the time and the money to skip the country for a little trip. But this New Year's, I realized that it doesn't take a document from the State Department, a plane ticket abroad or generous vacation time to immerse myself into other cultures. The United States, the melting pot of the world, allows such experience here at home. A friend from my graduate school days at American University, Jayshal Sood, invited me to his uncle's home in Orlando for an authentic Indian lunch on New Year's Eve, then to a party of Indian community members in the evening. Jayshal and I wanted to get a meal at an Indian restaurant in Washington, but we never found the time. So, for my first authentic Indian meal, Jayshal thought it would be best if I got some homemade cooking. What I got was more than just a great meal: It was a trip into a culture that, like many in the United States, is underappreciated. And it is The Offlede's purpose to appreciate the underappreciated. When I arrived at the home of Subira and Rajeev Sood, Jayshal's aunt and uncle, CNN was blaring on the television. 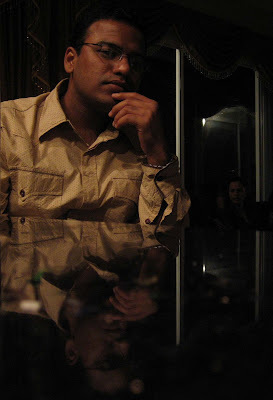 Jayshal is a talented broadcast journalist and native of the New Delhi area of India. His education and experience in journalism give him the acumen to talk critically about the media. The talking heads on CNN were theorizing about how former Prime Minister Benazir Bhutto was assassinated in Pakistan. Was she shot? Was she hit by shrapnel? Was she killed when her head struck the car? "The media is getting this all wrong," Jayshal said. Of course, India and Pakistan are neighbors with a long, tense history. I was curious to hear what my friend thought about the Bhutto incident and the tumult leading up to it - emergency rule, other assassination attempts, student protests. Jayshal said American media have not paid close enough attention to suspected perpetrators of the attack. How Bhutto died, he said, is immaterial. More interestingly, however, Jayshal said Bhutto has had the United States and the American media wrapped around her finger since the moment she returned. After all, the U.S. State Department (the people who granted my passport) maneuvered to help her return to Pakistan, from which she had been self-exiled for nearly 10 years. It was an effort to help boost election competition and spur democracy in Pakistan, a crucial ally in the "war on terror." But Jayshal said Bhutto was "just as corrupt" as other past Pakistani leaders. Indeed, Bhutto's time in Pakistani government was marked with allegations. She was ousted from her role as prime minister in 1990 when information arose regarding the laundering of funds into Swiss bank accounts. After being elected again in 1993, she was booted from office again in 1996, again on corruption charges. Though her overseas assets were confirmed and were questionable, she never was convicted of wrongdoing in connection with the money laundering charges. She also had been implicated in murder cases. Because of the problems she faced in Pakistan, she went into self-imposed exile in 1998. Considering her past, it's not surprising that her return faced such stiff opposition. Prime Minister and then-Gen. Pervez Musharraf's declaration of a state of emergency "was nothing new," Jayshal said. But because the American media have hyped Bhutto's return, much of what Musharaf did in the last few months has been interpreted as attempts to stifle her influence. Did the media seriously consider his action as a legitimate security measure? The media has failed to properly cover all sides of this issue. From talking with Jayshal, that is obvious to me. Our conversation taught me something that I would have missed if I had hung around my other friends for New Year's Eve. Here, you can see the three dishes on my plate with the flat wheat bread. The proper way to consume the food, Jayshal said, was to rip off some bread with your hands, grab the chickpeas, cheese or chicken, and eat it. Full of political conversation, Jayshal and I headed to the lunch table. Waiting for us were three traditional Indian dishes. One was chicken curry. Subira, Jayshal's aunt and the cook of this meal, is a vegetarian, so cooking meat was something new to her. "I have never cooked chicken," she said as she asked Jayshal to check the meat's doneness. It was cooked perfectly. The curry was tasty and, to my surprise, not very spicy. I occasionally eat hot foods, but my tolerance is quite low. This didn't pass my threshold. The next dish consisted of rectangular chunks of cheese made of milk. I was surprised when I learned that even the cheese was homemade. I wanted an authentic meal, and I was getting one. The cheese was mild and was mixed with peppers and onions. It had a consistency similar to soft tofu. Delicious. The third dish was chickpeas topped with slices of potato. Though I don't know all of the ingredients in these dishes, one thing is obvious: They have lots of spices. But more importantly, I know they all tasted great. All of these dishes were eaten with a flat, unleavened wheat bread. It's sort of like pita, but much tastier - probably because it was homemade. Subira would take a round loaf off the stove top, where it was allowed to brown slightly, then plop it onto my plate whenever I was done the previous piece. Talk about freshness. For utensils, I was given only a spoon. I started to use it, then Jayshal explained that it was only used to move ingredients around on the plate, or to cut the pieces of chicken. The traditional way to eat was to rip off a piece of bread, use it to grab some chicken, chickpeas or cheese, then plug it into your mouth. American etiquette does not apply here. Being from the Delhi area, Jayshal obviously doesn't like southern India's rice-based approach, instead touting the wholesomeness of north-central Indian food, which includes the wheat bread. 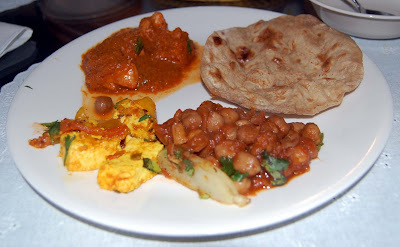 After becoming stuffed with knowledge of politics in Pakistan and India, my stomach also was bursting. There's so much you can learn if you meet the people and make the friends who will teach you such things.